This camera is supper mini camera, using 1/5” CMOSchip. The camera outside diameter is only7mm. 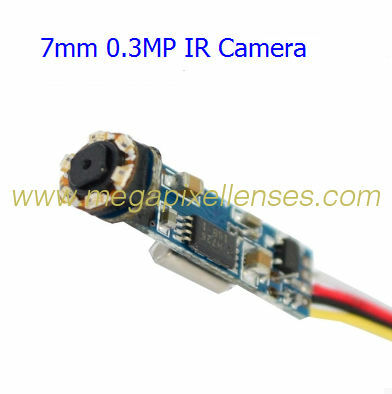 The camera uses 1/5” CMOS chip, clear imaging, the maximum pixel can reach 420TVL, 60 frames/second, no smearing; standard video signal output, can be connected with home TV, reversing displays and other display devices . Optional N / P system, automatically eliminating image flicker; equipped with six high-brightness infrared LED lighting, no lighting dead, no spot.